Writing my own blog. No, that doesn't mean writing posts on a new Blogspot or Wordpress blog. It means creating the blog itself - designing server database tables, writing the webpages and blog scripts, debugging, re-thinking, re-working. . . the whole software development cycle. 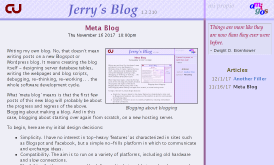 What 'meta blog' means is that the first few posts of this new blog will probably be about the progress and regress of the above. Blogging about making a blog. And in this case, blogging about starting over again from scratch, on a new hosting server. Simplicity. I have no interest in top-heavy 'features' as characterized in sites such as Blogspot and Facebook, but a simple no-frills platform in which to communicate and exchange ideas. Compatibility. The aim is to run on a variety of platforms, including old hardware and slow connections. Flexibility. As the programmer, I look forward to being able to make changes as I see fit, without having to depend upon Google engineering decisions. Would also like to hear any suggestions you might have. Should add that in this go-around, am trying to forego the use of mysql; straight php calls for less expense and server overhead, and for future flexibility. Goes without saying that this is experimental; time will tell how this will work out. glad you are keeping it simple. There are some pictures of Andrew on our gmail. Wwhat is mysql and a straight php call? i still want to hear your voice once in a while. i googled my answers to above comment. Far too complicated for my mind--computer talk. Stick to Linux--i like the penquin. i love you, Honey. Both mysql and php are stuff that web developers use to put together a web page. They are widely available on pretty much any web server, linux or otherwise. My comment above means i hope my blog will run a little better without mysql. Am still running Linux on my home computer as are you, but my new hosting service runs FreeBSD, which is why i had to re-work many of my processes. Not to worry: FreeBSD is not Microsoft Windows. It's alot like Linux, so much so that one of my favorite Linux sites, linuxquestions.org, has a forum for FreeBSD questions.